A warm and wonderful connection between University of Wisconsin Oshkosh radio TV film (RTF) students and alumni living and working in the industry continues to shine in Los Angeles, California. Last week, UWO alumnus Brad Carr ’01, hosted a showcase event at Endemol Shine North America for students taking part in UW Oshkosh’s Los Angeles Connection class. At the event, 15 students presented one- to two-minute collections of media work to everyone in attendance. The collections included work from the radio TV film department, student media and professional outlets. Carr also noted the unique nature of the Los Angeles Connection trip and how students can grow while in Los Angeles. “This is a great exercise for this class to be able to present, and not just be on the receiving end of going on tours and meeting with and speaking to people,” he said. 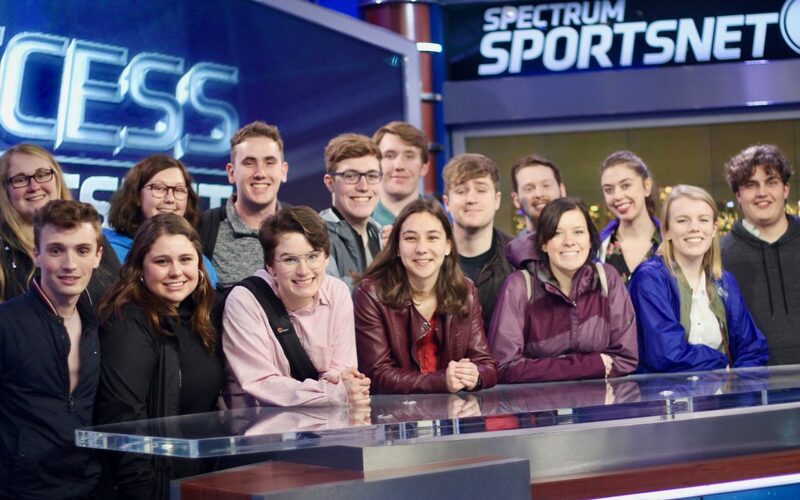 Justine Stokes, television services director at UW Oshkosh, organize and chaperoned the Los Angeles Connection trip. She said for students to be able to present their work in front of radio TV film alumni in the industry is an important step in their media careers. She added that holding the event at such an important media company like Endemol Shine, really “brings home” the reality of pursuing an entertainment career in Los Angeles. Another RTF alumna Kylie Hodges ’11, met with the current Oshkosh students earlier in the week and helped them develop their presentations. When she attended the event on Friday she was pleased with how the students represented themselves. “You all did a great job of being succinct and vocal and really confident in your stance in front of a large group, which I know can be intimidating, especially when you’re in front of a group of people who do what you want to do when you grow up,” she said. Recent graduate Cole Boettcher ’19, of Milwaukee, was grateful for the opportunity to present his work to alumni who are so prominent in the field. “We were able to showcase our work at a global production powerhouse. We are incredibly thankful to Brad Carr and everyone else at Endemol for opening their doors to us and giving us a genuine look into the business we are all striving to be in,” he said.